The Art Centre was established in 1984 by John & Ann Dodds. Specialising in high quality bespoke picture framing, it has established a wide and varied clientele including many professional artists. Today the business is run by their son, Peter Dodds GCF and Staig MacCallum GCF who collectively have over 50 years of framing experience. 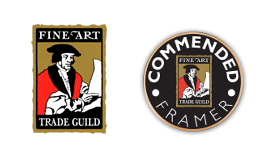 We are proud to be long standing members of the Fine Art Trade Guild and Guild Commended Framers. Our professionals undertake all types of picture framing, ranging from everyday items such as photographs prints and paintings, to more specialised items such as needlework, sports memorabilia and other 3 dimensional items. Both our framers can rely on their wealth of experience to offer expert advice to clients. They will guide you through a selection of hundreds of frames from the worlds’ top manufactures, dozens of mount colours and combinations and several glass types. All types of framing are offered to suit any budget, from standard everyday jobs, right up to gallery framing and work of conservation standard. Our service is both professional and efficient – please call at any time for more information or a framing quotation.